I am the kind of girl who likes facts! I am just like all of you. I have believed what the labels on my products have been telling me…without question. I haven’t minded slathering on hand sanitizer, deodorant, or lotion or even using those brightly colored dish soaps for my dishes. Until now, I have since learned that all of those store bought versions are loaded with toxic chemicals…who knew? (They sure didn’t mention it on the front of the label). Our skin acts like a sponge and those ingredients go beyond skin deep straight into our blood stream! Ugh!! You think I am crazy…Google it for yourself “dangers of Triclosan.” Triclosan is a very popular synthetic (meaning manmade in a lab) chemical that is used in just about every antibacterial product on the planet. Another thing that I have learned is that we have been brainwashed in believing that “suds clean.” Suds are made out of, you guessed it, synthetic chemicals, too, and really have nothing to do with the cleaning action of a product. Hint: You can Google any of those hard to pronounce ingredients listed on the label to educate yourself. Enough with the depressing stuff…are you one of those who might be missing your “suds” just a little. You are not alone…I miss the suds, too! Here’s a Quick Tip that an oily friend of mine shared with me, recently. 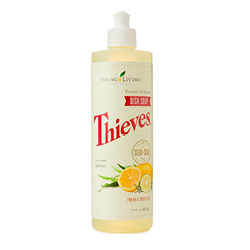 Empty squirt bottle (about an 8 ounce size) — You can reuse an empty Thieves dish soap bottle, shampoo, or bath gel bottle, too. Tip: Mix the water and baking soda together before adding to squirt bottle (to prevent a clump of baking soda in the bottom). Fill your sink with warm water and add a squirt of this mixture and wash dishes as usual. Voila!!! A quick tip to stretch your dollar, your product, and create natural suds! 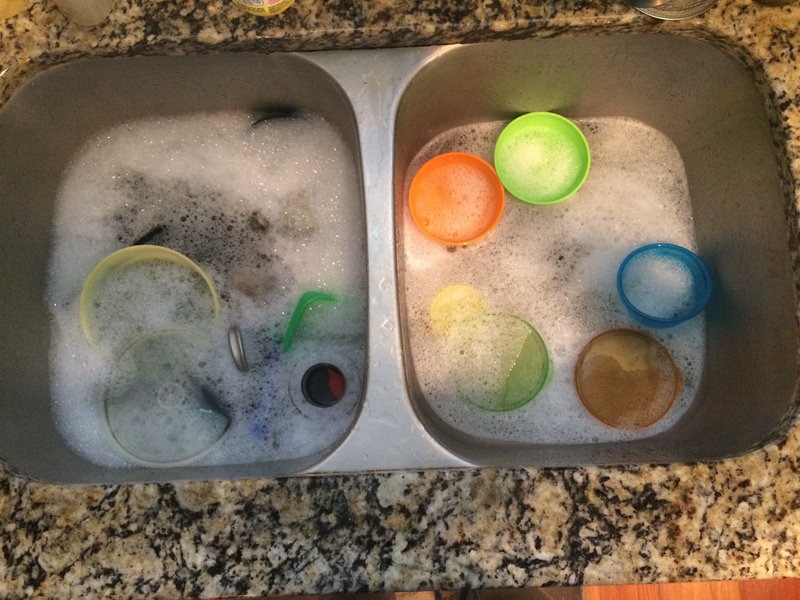 Pictured above: From my kitchen sink: On the Left is suds from a brightly colored dish soap and on the right is suds from the mixture mentioned here. Both were still sudsy an hour later. I have always been this way. No matter what perfume I smelled and even cleaning products, candles, scented lotions, and soaps. So many of those would get to me…so much that I had to go home and go to bed. Not until several years back did I learn that those scents are NOT natural. They are produced in a lab. They use chemicals to create those fake scents that make me “scent sensitive.” Are you “scent sensitive,” too? Now the moral of this story is that I continue to steer clear of those fake scents but I have found safe natural chemical and toxin free lotions, soaps, deodorants, make-up, and “smell good,” along with many other toxin free products that I use in place of those fake scents. Has your curiosity been peaked? Are you interested in learning something new? Do you want to rid your home of toxins and begin your very own journey to a chemical free lifestyle? Who wouldn’t want to improve their life and their family’s life? Everyday Oils with Young Living have been a game changer! I diffuse oils (i.e. Lemon and purification) into the air to replace scented candles and room sprays. I use oils like “Abundance” or “Joy” or “Believe,” as perfume, or “smell good” as my daddy likes to call it. I use “White Angelica” to lift the mood as we know through science that scents affect our limbic system (i.e. You may recall a memory from years past when you smell fresh baked cookies). I recently mixed the Christmas Spirit essential oil blend with White Angelica for and amazing uplifting aroma. Here’s my story: When I went to my first class to learn about Young Living Essential Oils, I was expecting to be Scent Sensitive, but the funny thing is…I was in that home for over 2 hours smelling oils and rubbing them on topically. You know what?! I never felt any different than I did when I stepped through that door. I was there for OVER two hours..My mind was blown! These oils were different! Young Living is Different! This is a 20+ year company. Gary Young, the founder of Young Living, is the pioneer in essential oils. His practices are what set the standard for other oil companies to follow. He is doing it right…and everyone knows it! If you don’t believe me, check out this video to see it for yourself Seed to Seal is not a slogan, it’s a PROMISE. 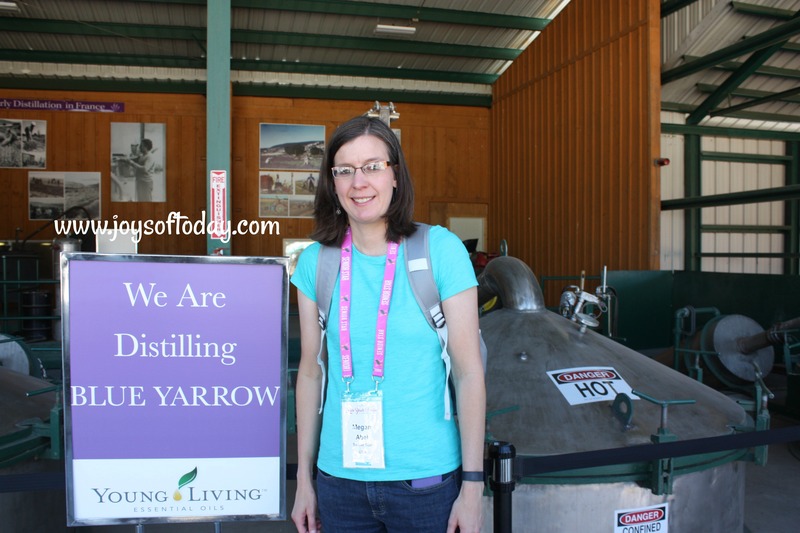 Young Living owns their own farms in the U.S. and other countries. I, personally, have been to their Lavender farm, in Mona, Utah. You talk about an experience! It is amazing to see huge vats distilling oils with your own eyes and the aroma is intense!! When I talk about Essential Oils, I am referring to Young Living Essential Oils. I do not have any experience with any other oil company and I can only vouch for Young Living. Disclaimer: This information is for educational purposes only and is not intended to diagnose, treat, or cure, any medical condition. This information is not FDA approved.